The following cases were heard under the Aroostook Criminal Docket at the Presque Isle Courthouse during the month of October. 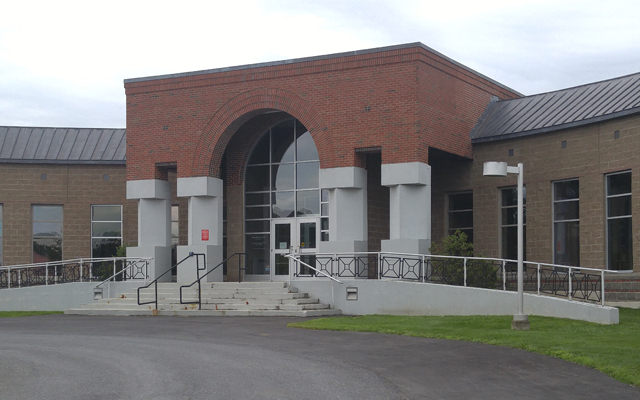 PRESQUE ISLE, Maine — The following cases were heard under the Aroostook Criminal Docket at the Presque Isle Courthouse during the month of October. Marcia A. Bailey, 53, Presque Isle: theft by unauthorized taking or transfer, dismissed; theft by unauthorized taking or transfer, $200 fine. Justice Spell, 32, Presque Isle: domestic violence assault, 41 days in jail. Chris W. Langille Jr., 36, Presque Isle: probation violation, 120 days in jail, probation partially revoked. Shannon L. Prestwood, 40, Connor Twp., theft by unauthorized use of property, 48 hours in jail, $2,657.28 restitution. Doris May Tardy, 52, Blaine: burglary, 90 days in jail. Carrie L. Wade, 36, Washburn: operating after habitual offender revocation, filed on $500 costs. Kyle P. Gagnon, 26, Limestone: criminal threatening with a dangerous weapon, dismissed. David Nelson Greenlaw, 42, Ansonia, Conn.: domestic violence stalking, dismissed. Lisa A. Perry, 55, Fort Fairfield: violating condition of release, 48 hours in jail; domestic violence assault, 60 days in jail, one year probation. Patrick M. Michaud, 20, Presque Isle: driving to endanger, dismissed. Chris Thomas Yale, 42, Mapleton: domestic violence assault, dismissed; disorderly conduct, offensive words, gestures, $300 fine. Michael A. Whitmore, 36, Lyman: theft by deception, dismissed; theft by unauthorized taking or transfer, dismissed. Cecilia L. Masters, 56, Westfield: terrorizing, 45 days in jail. Shawn D. Johnston, 34, Presque Isle: domestic violence assault, 10 months in prison allbut 40 days suspended, two years probation. Leanne Raye LaCombe, 34, Castle Hill: theft by unauthorized taking or transfer, priors, one year in prison, $8.47 restitution. Acil York, 42, Mars Hill:probation violation, probation revoked. Edwin D. Weiland, theft by unauthorized taking or transfer, eight days in jail. Jessica L. Eastman, 36, Ashland: theft by unauthorized taking or transfer, dismissed; misuse of entrusted property, $500 fine, $1,500 restitution. Timothy L Philbrick, 26, Easton: unlawful possession of scheduled drug, $400 fine, 48 hours in jail, $120 restitution. Darren Daylight, 51, Old Town: theft by unauthorized use of property, $200 fine; theft by unauthorized taking or transfer, 364 days in prison all but one year suspended, one year probation, $100 restitution. Justice A. Spell, 32, Presque Isle: domestic violence assault, 10 days in jail; violating condition of release, 10 days in jail. Adam T. Worsley, 34, Perham: unlawful possession of scheduled drug, violating condition of release, filed on $400 costs. Cody James Boucher, 30, Mapleton: domestic violence assault, 75 days in jail all but 40 days suspended, two years probation. Harmony Cray, 27, Presque Isle: unlawful trafficking in scheduled drugs, dismissed. Travis Styles, 29, Presque Isle: aggravated assault, dismissed; domestic violence assault, 364 days in prison all but 59 days suspended, two years probation, $183.00 restitution. Rachel L. McGraw, 46, Washburn: failing to give correct name, address or DOB; operating while license suspended or revoked, prior, filed on $500 costs. Harmony Cray, 27, Presque Isle: theft by unauthorized taking or transfer, seven days in jail; violating condition of release (two counts), seven days in jail. Travis Styles, 29, Presque Isle: violating condition of release, dismissed; violating condition of release, four days in jail, two years probation, $183.00 restitution. Daniel R. Ferranti, 28, Presque Isle: theft by unauthorized taking or transfer, six months in jail, $6,986.94 restitution; theft by unauthorized taking or transfer, four years in prison all but six months suspended, two years probation, $6,986.94 restitution; aggravated criminal mischief, dismissed. Stephen M. Desmond, 34, Presque Isle: probation violation, probation revoked. Jerry L. Hayes, 47, Presque Isle: misuse of public benefits instrument, $100 fine. Casey Gagnon, 20, Castle Hill: misuse of public benefits instrument, $1.76 restitution, 20 hours community service; theft by unauthorized taking or transfer, dismissed. Brian M. Lovely, 23, Castle Hill: misuse of public benefits instrument, $6.10 restitution, 20 hours community service; theft by unauthorized taking or transfer, dismissed. Walter Rice, 62, Presque Isle: OUI (alcohol), dismissed. Bayleigh E. Voisine, 28, Mapleton: violating condition of release, $300 fine. Marvin D. Burch, 29, Hollywood, Fla.: motor vehicle speeding: 30-plus mph over speed limit, dismissed. Trisha L. Carmichael, 42, Fort Fairfield: theft by unauthorized taking or transfer, 18 months in prison all but 120 days suspended, two years probation; criminal threatening, 30 days in jail; unlawful possession of scheduled drug, $400 fine, 10 days in jail. Kellie Stitham, 25, Easton: misuse of public benefits instrument, $200 fine, $106.29 restitution; theft by unauthorized taking or transfer, dismissed. Jessica A. Gorham, 35, Ashland: assault, $300 fine. Doris May Tardy, 52, Blaine: burglary, five years in prison all but 90 days suspended, three years probation; stealing drugs, 90 days in jail. Cameron K. Tardie, 28, Presque Isle: operating while license suspended or revoked, prior, $750 fine. Joshua D. Turner, 33, Currie Siding: operating while license suspended or revoked-OUI, dismissed; possessing suspended driver’s license, dismissed; violating condition of release, dismissed; operating while license suspended or revoked, $250 fine. Steven C. Cray, 35, Washburn: operating after habitual offender revocation, prior, $1,000 fine, seven months in jail; attaching false plates, 60 days in jail; violating condition of release, 60 days in jail. Richard M. Kinney, 48, Easton: operating while license suspended or revoked-OUI, $600 fine, 20 days in jail, one-year license suspension. Jesse Joseph Robbins, 37, Presque Isle: domestic violence assault, dismissed. Jerry L. Hayes, 47, Presque Isle: aggravated forgery, dismissed. John J. Lucier, 46, Presque Isle: domestic violence assault, dismissed; reckless conduct, $400 fine. Joshua B. Caldwell, 30, Bangor: possession of hypodermic apparatuses, $400 fine; violating condition of release, three days in jail. Stephen M. Desmond, 34, Caribou: unlawful possession of scheduled drug, $400 fine, 60 days in jail; falsifying physical evidence, 60 days in jail. Donna E. Johnson, 22, Presque Isle: theft by receiving stolen property, $300 fine; displaying fictitious vehicle certificate, dismissed; violating condition of release, $350 fine. Trevor J. Kinney, 39, Easton: operating while license suspended or revoked, prior, $500 fine. Kyli Jo Harris, 28, Fort Fairfield: OUI (drugs or combo), dismissed; driving to endanger, $575 fine, 60-day license suspension, $120 restitution. Philip J. Dionne, 63, Caribou: violating condition of release, $250 fine, five days in jail. Richard M. Kinney, 48, Houlton: operating while license suspended or revoked-OUI, dismissed. Lance Lee Cormier, 36, Van Buren: violation of fishing rule, 10 hours of community service; fish without valid license, $100 fine. Tyler Farley, 28, Houlton: fishing without valid license, $100 fine. Daniel R. Ferranti, 28, Presque Isle: failing to register vehicle, $200 fine; attaching false plates, $150 fine; violating condition of release, 10 days in jail. Eric M. Condon, 32, Easton: operating while license suspended or revoked, prior, $500 fine; violating condition of release, $250 fine. Joshua B. Caldwell, 30, Bangor: possession of hypodermic apparatuses, dismissed; unlawful possession of scheduled drug, $400 fine, 10 days in jail, $120 restitution; violating condition of release, 10 days in jail. Conner A. Mahan, 21, Mars Hill: OUI (alcohol), $500 fine, 150-day license suspension; operating vehicle without license-condition/restriction, dismissed. Richard M. Kinney, 48, Houlton: operating while license suspended or revoked-OUI, $600 fine, 20 days in jail, one year license suspension. Justin A. Iaciofano, 32, Mars Hill: domestic violence terrorizing, 12 months in prison all but 90 days suspended, one year probation. Justine J. Labier, 19, Presque Isle: OUI ( alcohol), $500 fine, 150-day license suspension. Daniel W. Corey lll, 47, Chapman: theft by unauthorized taking or transfer, $200 fine. Shawn D. Johnston, 34, Presque Isle: violating condition of release, 30 days in jail; criminal trespass, 30 days in jail. Amanda Clair, 32 Easton: operating while license suspended or revoked, prior, $500 fine. Acil York, 42, Mars Hill: violating protection from abuse order, 30 days in jail. Eric T. Sweet, 47, Mattapoisett, Mass. : fail to stop all-terrain vehicle, dismissed. Lorraine N. Michaud, 50, Presque Isle: disorderly conduct, fighting, $400 fine. Anthony F. Nadeau, 34, Stuben: operating while license suspended or revoked, prior, $500 fine. Sidney Duncan, 57, Presque Isle: assault, dismissed; disorderly conduct, offensive words, gestures, 20 hours of community service. David A. Corey, 63, Caribou: operating while license suspended or revoked, $250 fine. Vincent Pelletier, 25, Fort Fairfield: operating while license suspended or revoked, prior, $500 fine. Jerry Clavette, 27, Presque Isle: operating while license suspended or revoked, prior, $750 fine. Chelysea Sabatis, 24, Houlton: operating vehicle without license, $150 fine; violating condition of release, $100 fine. Gage Robinson, 20, Rockland: operating motor vehicle with defective system, filed on $100 costs. Joseph Byron Haines, 70, Mapleton: burning prohibited material, $100 fine. Michael Allen Latronica Jr., 41, Washburn: theft by unauthorized taking or transfer, $200 fine. William Knowles, 21, Presque Isle: criminal mischief, $200 fine, $945 restitution. Parry Corey Gagne, 20, Portage: criminal mischief, $200 fine, $945 restitution. violating condition of release, $500 fine, 10 days in jail; operating after habitual offender revocation, 30 days in jail. Richard M. Kinney, 48, Easton: operating while license suspended or revoked, OUI, dismissed; attaching false plates, dismissed. Lorraine N. Michaud, 50, Presque Isle: theft by unauthorized taking or transfer, $200 fine, $29.43 restitution. Antony P. Philbrick, 26, Presque Isle: theft by unauthorized taking or transfer, $200 fine, $23.44 restitution. Jacob D. Cyr, 24, Presque Isle: operating while license suspended or revoked, $250 fine; violating condition of release, $250 fine. Michael Craig, 56, Fort Fairfield: criminal trespass, 24 hours in jail. James A. Krysiak, 72, Presque Isle: illegal placing of bear bait, $100 fine. Jesse G. Murchie, 34, Fort Fairfield: failing to stop for officer, 48 hours in jail; refusal to submit to arrest or detention, refusing to stop, $300 fine, 48 hours in jail. Lucas Wynn, 32, Presque Isle: violating condition of release, 72 hours in jail. Mitchell D. Hanning, 28, Mapleton: operating after habitual offender revocation, $500 fine, 30 days in jail; attaching false plates, 48 hours in jail. Eric J. York, 35, Presque Isle: operating vehicle without a license, filed on $100 costs. Randy L. Fulton Sr., 50, Mars Hill: violating protection from abuse order, $250 fine, 48 hours in jail; violating condition of release, $250 fine, 48 hours in jail. Michael Mills, 31, Presque Isle: violating protection from abuse order, 10 days in jail; violating condition of release, 10 days in jail. Leland R. Alger Jr., 35, Presque Isle: operating while license suspended or revoked, prior, $750 fine. Kirk A. Tompkins, 45, Fort Fairfield: violating condition of release, 48 hours in jail. Brandi S. Guertin, 44, Chapman: operating while license suspended or revoked, prior, $500 fine. Taylor S. Condon, 26, Ashland: allowing minor to possess or consume liquor, $500 fine, 48 hours in jail; violating condition of release, five days in jail. Leanne Raye LaCombe, 34, Castle Hill: violating condition of release, 60 days in jail. Jacob M. Rodgers, 28, Fort Fairfield: operating ATV on public way, $100 fine. Scott Long, 19, Presque Isle: operating ATV on public way, $100 fine. Debra L. Walton, 58, Fort Fairfield: allowing minor to operate ATV in violation, $100 fine. Eric T. Sweet, 47, Mattapoisett, MA: operating ATV on public way, $250 fine. Justine J. Labier, 19, Presque Isle: minor transporting liquor, dismissed. Lawrence Hersey, 58, Fort Fairfield: operating ATV on public way, $100 fine. Danielle Webb, 34, Presque Isle: littering, dismissed. Travis J. Webb, 40, Bangor: littering, $300 fine. Stephen Bartlett, 63, Portland: disposal of slashing along highway, $100 fine.